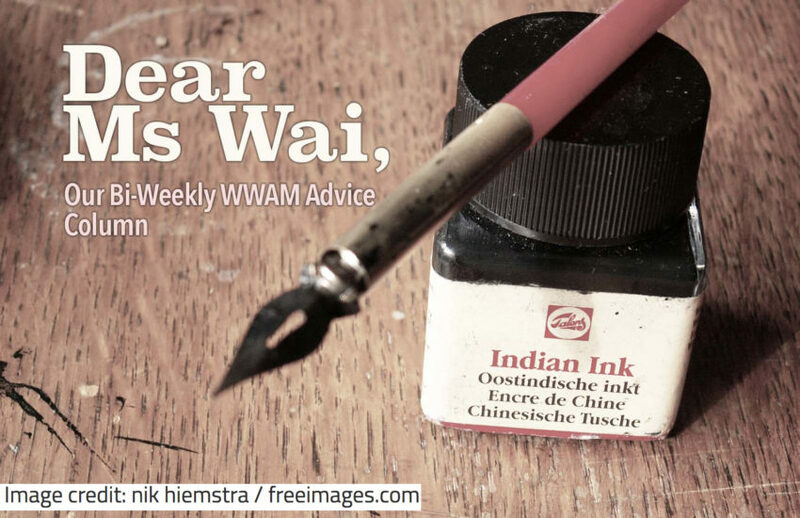 Dear Ms. Wai -- Teacher/Student Relationship | WWAM Bam! I found your blog and advice posts online and I thought I would reach out because I need some advice myself. I have been living in china since December of last year and since the beginning of February I have been privately teaching 2 businessmen English. I soon became attracted to 1 of them and since I didn’t believe I should cross the student-teacher line even though they are both older than me I kept my feelings to myself. That is until the man I’m interested in started becoming more friendly with me and even what I would consider flirty at times. He has asked me to the movies twice and dinner once both of which he insisted on paying for. Most recently I adopted a puppy and when he found out I was going to pick it up he offered to drive me there and then has come over consecutive days because he wanted to see the puppy and me. Just yesterday he came over to give me zongzi that his mother had made for the dragon boat festival. In any normal situation I would think he was interested in me but has yet to make a real move but I’m not sure this is a normal situation. I’m a foreigner and his teacher which makes me think that’s why he’s being nice to me. But still the part of me that is attracted to him makes me think he’s into me as well. I hope you can help me because I really need some advice on what to do. Sounds like you have an ambiguous situation common to dating in China. Many women will tell you stories similar to yours about how they met their husband. Meanwhile, many women will also tell you similar stories that ended in embarrassment when they expressed their feelings and the guys didn’t return them. And now it’s your turn. Because it’s unclear to you and it’s unclear to me. You are totally right in thinking that your situation, as his teacher, gets you a little more attention. And it’s hard to tell just from your letter what his real intentions are. Maybe he is secretly passionately in love with you…or maybe he just really likes dogs. It’s up to you to find out! Is it puppy love or does he just love puppies? If you really want to try for a relationship, I think you need to be the more forward one. But you have to be ready that he might say no. The fact that he is your student adds a little complication. If he rejects you and feels really embarrassed he might not want to come to class anymore. Can you afford to lose that income? Because in both the best, and worst, case scenario you probably aren’t going to have him as a paying student for much longer. So if you’re okay losing the money, I say do whatever feels comfortable to you. He’s already coming over to your house regularly, so maybe try to make small moves like touching his hands while talking, or hugging him hello. See how he reacts to those things. If it’s still unclear, you might just want to come out and say something. You can say something like, “You’re my student but we have been spending so much time together out of class I feel like you are more than my student,” and see what he says to that. Or, if that’s too forward for you you can always make up a neighbor or friend and say, “My neighbor/friend has seen you coming over a lot and asked if you were my boyfriend.” He should hopefully take the bait and say something like, “What did you tell her?” and you can say “Just friends. But do you want something more?” or something like that. You’ve known him for a long time and seems like you are getting closer. For your own piece of mind, and for hopefully the beginning of a beautiful relationship, you need to get to the bottom of this and figure out what his feelings are. With culture and language differences, subtle moves aren’t going to necessarily bring you clarity so I say just go out there and make it happen. Does Ashley know if the man is married or not? Chinese men don’t usually wear wedding rings, and being a business man, I would advise caution about entering into a personal relationship with someone who you have probably not met in situations other than that of teacher/student. I would try to meet others from his social circle before any dating – ask (casually) to meet other friends as this will indicate if he is serious or just keeping you as a secret. Another indication would be, does he take you out at the weekend or during the week?